Egypt's churches came together Last week to denounce an increasingly visible former Seventh-Day Adventist leader. For the past two years, Galal Doss, the chairman of a popular cosmetic and food company, has been distributing thousands of brochures and calendars featuring his ideas on Christianity to Egypt's Coptic Christian community. Doss is a former member of the Seventh-Day Adventist Church who left the group in 1999 to propagate Adventist beliefs on his own because he felt the church was not doing enough. Recently, however, Doss has been heavily criticised by the Coptic Church, which released a press statement last week saying the Coptic Church needed "to make people aware of a deviant group's suspicious activities so as not to be lured by the group's discourse, which goes completely against the church's teachings". 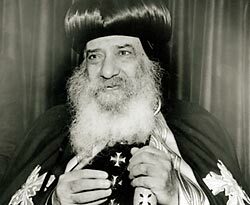 It was not the first time Coptic Pope Shenouda III has targeted Doss's group. Al-Keraza, a weekly church magazine which Shenouda edits, has featured several articles by Shenouda himself critical of the Adventist- inspired group's creeds. Last week's announcement by the church was a direct reaction to Doss's most recent high-profile effort to spread the Adventist word by sending out -- via ordinary post -- dozens of thousands of brochures and calendars to Copts, mailers that also offered to provide even more material about the group's belief -- in the form of books and pamphlets -- to those who were interested. Raymond Mitri, an engineer who received the parcel, described it as "very strange". It was like the group was trying extremely hard to attract him to their teachings, he said. The most obvious difference between Seventh-Day Adventists and other churches is that the former observe Saturday as their Sabbath. The neglected commandment is the title of one of Doss's brochures, referring to the fourth commandment God gave to Moses: that Saturday is sacred. According to Doss, "ignoring one of God's 10 commandments makes us criminals. And even though all we want is to attract attention to this ignored commandment as it is written in the Holy Bible, other denominations attack us as a result." Doss said that he was born and raised as an Adventist, but that he left the group in 1999 because of "their weakness in dealing with social and religious issues". Since then he has practiced independently, and prefers to refer to himself as someone who is "preserving God's commandments". Although he says he is not the "leader of any group", Doss says between 10-20 people have the same beliefs as he does. Coptic Church Youth Bishop Moussa said that the church was not battling Doss himself but "his religious teachings and beliefs, which are a heresy which contain Jewish and anti-Christian ideas, such as the sacred Saturday". But while Moussa claimed that Doss pressures his employees into adopting his beliefs, Doss denied the allegation. "It is not true that I force the employees to adopt my creed, and 97 per cent of employees are Orthodox," he said. As a result of both the size of the mail campaign, and the high quality of the colour brochures, the Coptic Church also accused Doss of being financed from abroad, which, again, Doss denied. "I am not funded from abroad. I am a businessman and I don't need any financial aid." Egypt's three Christian denominations -- Coptic, Catholic and Evangelical -- held an ecumenical meeting recently to show their unity against what they perceive as the Adventist threat. According to Catholic Bishop Yohanna Golta, reserving Sunday for rest instead of Saturday is a tradition from the era of the apostles and marks Jesus's resurrection on Sunday. "When will the heresies that arrive from abroad under the banner of Christianity end?" Golta asked. The heavy proselytism practiced by Adventists was also criticised during a meeting of heads of the Oriental Orthodox Churches in the Middle East held in Syria in February 1999. Called Al-Sabteyeen in Arabic, the Adventists first came to Egypt in 1932, propagating their teachings by offering aid to the poor and building orphanages and hospitals. The group's origins can be traced to the 19th century, when James and Ellen White founded the movement, travelled widely as a missionaries and wrote books that form the basis for the main teachings of Adventist groups worldwide. Adventists -- including ex-Adventists like Doss -- consider White a prophetess.